Canby—Canby's high school wrestling program had a solid year this past season. Highlights included a district champion in Stephen Rue, and dual meet victories over Tigard and Lakeridge. The future looks bright for the Cougars, especially considering the talent that will enter the ranks next year. Baker Prairie Middle School's Cobie Daly took first place in the middle school state tournament on Mar. 10 that took place at Woodburn High School. 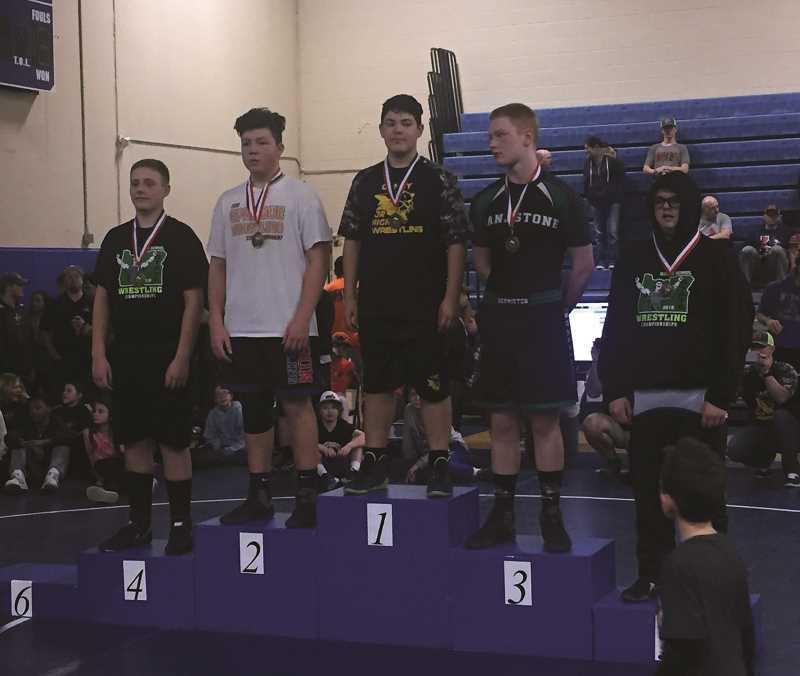 Daly, an eighth grader, secured the first place finish with four straight pins, and in convincing fashion too. "He was very dominant," middle school wrestling coach Doug Kivett said. "He's got that really good snap down front headlock. He's very good at it, and that's what he used in every match, pretty much. He ended up in either a head and arm, or a leg ride pin." The thing that makes Daly's victory even more impressive is that he was wrestling from the lower end of the weight class. While some of his opponents weighed in at the upper threshold of 220 pounds, Daly only weighed 198 on the day of his competition. Over the course of the season and on his run to the first place finish, the size discrepancy was something he had routinely overcome. "He had gotten used to it and learned not to shoot, for one," Kivett said. "But he's pretty quick and that makes up for a lot of the underweight disadvantage. I think that helped a lot, his quickness, strength, and intelligence." Daly, a quiet, polite kid who is a member of Baker Prairie's jazz band, will wrestle for Canby High School next year. The move up into the shark tank that is the Three Rivers League may prove difficult, but Daly should be able to compete right away, even if he encounters early adversity. "Being a freshman, it's tough no matter what weight you are," Kivett said. "Typically the younger guys are a little lighter weight. Being a bigger guy at a bigger weight, he's probably going to have some strength issues that he may need to lift really well the next couple years to sort out." Kivett added, "He knows how to work hard. I think the biggest thing is going to be that he's the lower side of the weight bracket. If he's able to lift weights and put on a few pounds that way, it'll be very beneficial for him." The middle school wrestling program was hit hard by kids moving up into high school, going from 22 participants last year to 12 this year. Still, the program continues on and expects to thrive next year with an influx of fifth graders. Only losing three upperclassmen at the end of this season, the team hopes to retain kids through the efforts and examples set by athletes like Daly. "Cobie was absolutely a leader," Kivetts said. "During practices when we're doing calisthenics and warming up, we let the kids do the individual count offs. I try to pick out the upper classmen and standout kids. I try to keep everyone cohesive and part of the team." "Cobie was a pleasure to coach this year," Kivetts added. "He showed up, worked hard. We're looking forward to next year, building the middle school program so we can feed the talent to the high school so we can help there too."